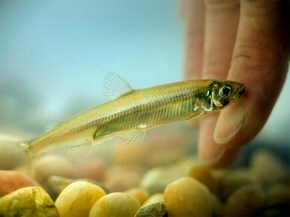 The April survey of Delta smelt found only 1 fish in an inspection of 40 locations. 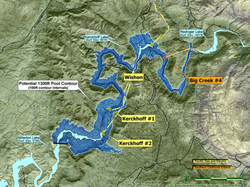 Last year’s attempts by the State Water Resources Control Board to balance the needs of fish and humans led to the loss of 95% of the year-class of endangered winter-run Chinook salmon. Longfin smelt and starry flounder are at their second lowest recorded levels, and a recently published scientific study in San Francisco Estuary & Watershed Science concluded that most wild Central Valley salmon runs will be minimal or completely extirpated by 2100. The loss of multiple fish species will be a tragedy attributed by many people to the drought. Certainly the drought has stressed our natural environment even as it has strained human resources. However, as covered in the Bay+Delta+Water: Better Together conference last September, these fish have experienced chronic stress as the result of inadequate flows released to the Bay for the past decade and longer. This chronic stress—and the stress of the drought—has been compounded by the water management decisions made by the State Water Board in cooperation with other state agencies for the past two years. Delta outflow standards exist to ensure that all of the fresh water doesn’t get pumped out of the Bay-Delta Estuary for human use alone, thereby protecting fish and wildlife that depend on the Bay and Delta. Yet, as California’s water supply dwindles with the ongoing drought, the demand grows louder to divert every last drop of fresh water that reaches our Bay. The State Water Board’s decisions to suspend Delta outflow requirements leave very few resources to protect our Bay and Delta fish species. The Bay Institute has set up a “Countdown to Extinction” page that offers easy ways to send comments to the State Water Board to urge them to reverse their decision. As well-known fisheries biologist and Delta smelt expert Peter Moyle stated recently in National Geographic, the smelt "is a beautiful fish. It's the will of the American people that we can't let any species go extinct. I believe we have a moral obligation to keep the Delta smelt around." 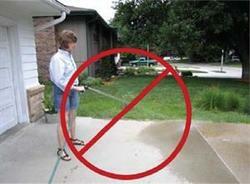 Washing sidewalks and driveways with potable water is now prohibited under California's emergency drought regulations. The Governor’s April 1, 2015 Executive Order directs the State Water Resources Control Board (State Water Board) to impose mandatory water use restrictions to achieve an aggregate statewide 25% reduction in potable urban water use through February 2016. Since then, the State Water Board has released a draft regulatory framework for achieving this reduction and draft emergency regulations for public comment. The draft regulatory framework, revised in response to public comments, categorizes urban water suppliers into nine tiers according to their reported July-September 2014 usage. Suppliers with the lowest reported use, such as Westborough Water District in San Mateo County, will only need to meet an 8% conservation standard. Suppliers with the highest reported use such as the Town of Hillsborough, also in San Mateo County, will need to meet a 36% conservation standard. Draft emergency regulations prohibiting certain uses of drinking water have also been issued by the State Water Board; these are similar to the drought regulations already in place. Prohibited actions include outdoor irrigation that causes excessive runoff, the use of water in non-recirculating fountains, and other uses. The proposed regulatory framework and emergency regulations will be considered for additional public comment and adoption at the State Water Board’s May 5-6 meeting. The Fourth District Court of Appeal ruled on Monday that San Juan Capistrano’s tiered water rate system violates Proposition 218. Prop. 218, passed by voters in 1996, can severely limit a water agency’s capacity to implement conservation-based rates due to its “proportionality” rule, which states that the cost of water to consumers must reflect the cost of delivering the water. Originally intended to protect California rate payers from arbitrary service costs, Prop. 218 has had the unintended consequence of constraining the implementation of tiered rate structures designed to encourage conservation and efficiency of use (see Paying for Water in California, PPIC 2014). The same proportionality rule also discourages the use of “lifeline” discounts for low-income residents. The timing of this ruling is both ironic and unfortunate, considering that the Governor’s April 1 Executive Order specifically directs urban water suppliers to “develop rate structures…and other pricing mechanisms…to maximize water conservation” as a means of achieving conservation targets. In a statement released Monday, Governor Brown said, "The practical effect of the court's decision is to put a straitjacket on local government at a time when maximum flexibility is needed. My policy is and will continue to be: employ every method possible to ensure water is conserved across California." Although state officials will neither confirm nor deny the rumors, a number of recent newspaper editorials (see below) have devoted coverage to a presumed overhaul of the Bay Delta Conservation Plan (BDCP). This overhaul appears to drop almost all of the conservation measures of the original plan, including over 100,000 acres of proposed habitat restoration, leaving only construction of the twin tunnels and any associated mitigation. Both environmental organizations and water agencies have expressed concerns about the overhaul, its economic feasibility to beneficiaries, and its benefits to the health of the Estuary. The overhaul was prompted by concerns of federal fisheries biologists that the previously proposed plan would not significantly benefit threatened species, making approval of a 50-year permit unlikely. The new overhaul would enable project planners to submit applications for 10-year permits instead, which have less arduous requirements. Yet the disposal of all conservation measures—except for the one that ensures a more reliable water supply—makes it difficult to believe that the BDCP was truly intended to achieve the coequal goals. Help support our Freshwater Flows Program with a tax-deductible donation today!